NASA is testing repairs on the space shuttle Endeavour in the hopes they will allow the orbiter to launch on one final mission next week. Shuttle officials called off Endeavour's first launch attempt on Friday (April 29) when two heaters protecting a crucial power unit had failed. Without the heaters, the unit would likely freeze on orbit and be unable to serve its role as one of three power sources for Endeavour's hydraulic systems during re-entry and landing. They are now testing the old box to determine the source of the problem. "Technicians are trying to determine what caused the power box to fail," according to a NASA statement. "Initial testing from yesterday shows a driver (circuit) inside the LCA-2 shorted out." NASA has not set a new launch date for Endeavour, but mission managers have said the mission will not lift off before May 10. A meeting of top shuttle manager tomorrow (May 6) is expected to end with a new launch target. "Managers will continue to evaluate the repair process and make any additional adjustments before scheduling Endeavour’s next launch attempt, which remains no earlier than May 10," NASA's statement said. Endeavour's crewmembers returned to Houston, where they live and train, after their launch delay. The crew will continue training until a new launch date has been set. Wednesday the astronauts met with their flight directors and robotics and spacewalk officers to review plans for their mission. After Endeavour's flight, NASA has only one more space shuttle mission planned. The shuttle Atlantis is scheduled to lift off June 29 for its last journey to the International Space Station. However, if Endeavour's mission is delayed much further, NASA has said the Atlantis flight could be pushed back, too. Once the orbiters are retired, they will be sent to museums for public display. 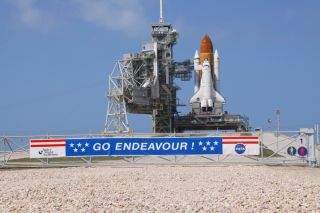 Endeavour is bound for the California Science Center in Los Angeles, while Atlantis will go to the Kennedy Space Center's Visitor's Center. Their sister orbiter, Discovery, is marked for the Smithsonian's Air and Space Museum in Washington, D.C. A prototype shuttle called Enterprise, which never made it to space, will be displayed at New York's Intrepid Museum of Sea, Air and Space.